It has been a year. I miss her. I think about her a lot. It seems so unfair that life goes on when she is not here. I have thought of her often over the past year. I think of her every time I drive past the left turn I used to take to her house. I think of her when I see a full moon. I think of her every time one of my kids asks me a science question that I don’t know the answer to but that she would have. I think of her at random times when my mind wanders. I miss laughing with her. I miss going to her house with Big Gulps for each of us. I miss the way she used her hands to demonstrate whatever scientific principle she was explaining. I miss how encouraging she was of her friends. I miss how much she believed in everyone. I miss how she held friends together. I miss her smile. There have been many things I wanted to share with her in the past year. I wanted to tell her about my Asperger’s diagnosis. I think she would have been amazing about it. I wanted to tell her how well Jack was doing. She was one of his biggest cheerleaders. I wanted to put her name on a list of references for an application I filled out. I wanted to ask her advice about so many things. I wanted to chat about books and movies and blogs and the tremendous good and energy that she put into the world. I missed her so terribly after I ran my 8k in September. When I posted on Facebook that I had finished the race, something that was a challenge for me, a mutual friend commented, “As Susan would have said, ‘Of course you did. '” Exactly. Exactly. I miss her. One of the last times Susan and I sat and chatted, a rotating prism that her husband had bought her was twirling in the sunlight, covering her in rainbows. That is one of the way I like to remember her: shining like a rainbow; strong and nuanced like the cratered, slate-colored moon; and gorgeous as her amazing smile. 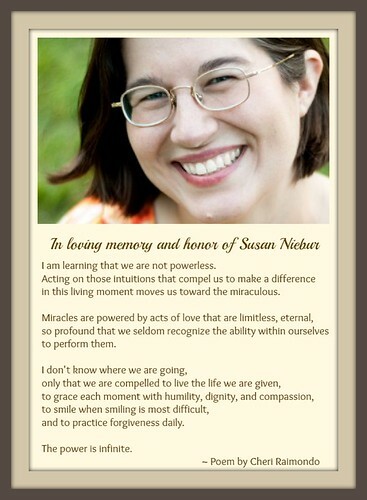 No post about Susan can ever do her justice or express the enormity of her loss. I always love you, Susan. As Susan’s friends remember her today, consider furthering her legacy through a contribution to the Inflammatory Breast Cancer Research Foundation or the American Cancer Society.